In this screenshot from YouTube, a man dangles his feet from the scaffolding surrounding Philadelphia's City Hall clocktower. 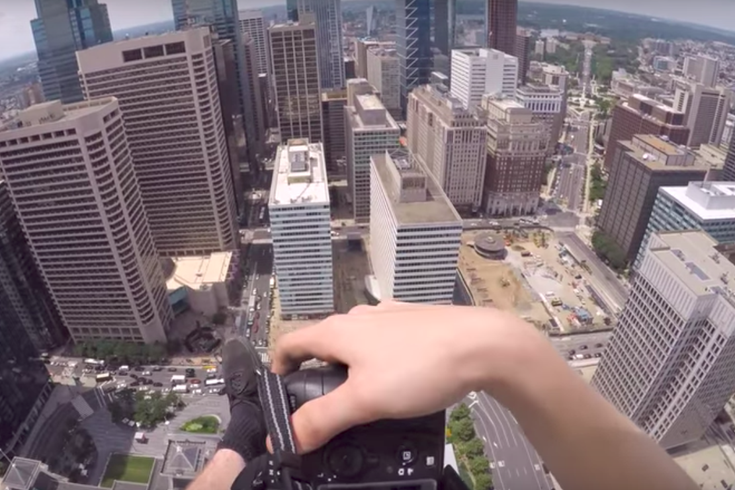 An adventurous man took an unauthorized climb atop Philadelphia's City Hall clocktower, recording video and snapping photographs of his foray on the scaffolding that enshrouded the statue of William Penn until recently. In one picture, the man shows his feet dangling from the scaffolding – nearly 550 feet above ground. The man, who identifies himself as Carson King, of Washington, D.C. on his Facebook page, posted a nearly seven-minute video of his climb to his YouTube and Facebook pages on Sunday. In an interview conducted via Facebook, King declined to verify his personal information, nor state when the video was taken. But he said his adventure above the streets of Philadelphia ranks among the top two or three places he has explored. "The most thrilling part of the climb was the dangle," King said. "I love dangling my legs off the side because it gives me a sense of freedom and it also makes for a good shot." In the video, King climbs a ladder atop City Hall, enters a door to the interior of clocktower and ascends the stairway to the observation deck. Once there, he climbs onto the scaffolding surrounding the 37-foot-tall bronze statue of William Penn, which underwent renovations earlier this year. King decided to climb the municipal building because it is a historic landmark and offered an "amazing" view, he said. "I wanted to be the first to take pictures from there without having the thick glass barrier on the sky deck in my way," King said. "When they put up the scaffolding to clean old Billy I figured why not and so I did." City officials were not amused by King's climb, noting his actions were both dangerous and illegal. "We're extremely concerned by this video," city spokesman Mike Dunn said. "What this person did was dangerous and illegal. The scaffolding is now down, but Philadelphians should be aware of the extreme risk they pose to their personal safety if they engage in activity like this." The video does not document how King entered the roof of the government building, nor does it show his descent from it. But King said he did not pass a single "No trespassing" or "Do Not Enter" sign. "We are artists not vandals," King said. "Nothing was damaged, destroyed, or even moved. I did not pick a single lock or break any doors. There are those who vandalize and spray paint places like this but many of us are not those people and there should be a fine line between us. People need to know the difference." King's Facebook page includes videos of him exploring other locations, including an abandoned stadium from the 2004 Summer Olympics in Athens. He also explored an abandoned airport while in Greece. In posting his City Hall video to YouTube, he explained the protocol for his explorations. "I go to video and take pictures because it is what i love to do. I document these places before they are gone. I enjoy researching and learning the history behind the places I go." "I climbed the famous Philadelphia city hall clock tower while it was under construction. I believe that this is the only video you will ever see of someone doing this and I went up by myself. This city hall is the largest city hall building in the country. I also apologize for how little i talked in the video due to the fact I was under lots of stress on my way up. Hope you enjoy the video! much more to come!" Tourists or Philadelphia residents who wish to legally visit the City Hall clocktower can do so by purchasing tickets online or visiting the City Hall Visitor Center. Adult tickets cost $8.